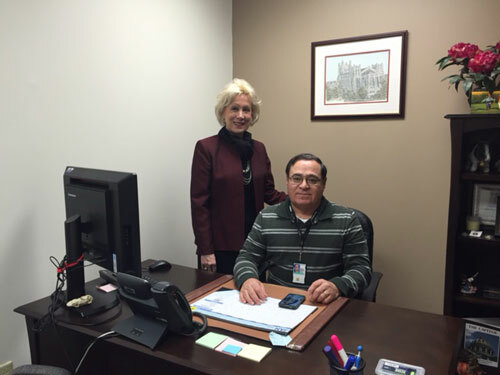 Pictured with Rep. Karen Boback (Lackawanna/Luzerne/Wyoming) is Luis Ybarra from the Veterans of Foreign Wars. Luis visits Boback’s Dallas district office on the third Tuesday of each month, weather permitting, from 10 a.m. to 2 p.m.
HARRISBURG – Rep. Karen Boback (R-Lackawanna/Luzerne/Wyoming) today announced her outreach events and satellite hours for March. Representatives from several different organizations will offer assistance at her district offices throughout the month. The satellite hours have resumed for 2017 and will be offered through October. Please note these events are weather permitting. • Wednesday, March 1, at the Dalton Borough Building, located at 105 West Main St., Dalton, from 10 a.m. to noon. • Tuesday, March 7, at the Mehoopany Township Municipal Building, located at 237 Schoolhouse Road, Mehoopany, from 10 a.m. to noon, and then at the Meshoppen Borough Building, located at the intersection of Canal Street and Route 267 in Meshoppen from 1-3 p.m.
• Thursday, March 9, at the Factoryville Borough Building, located at 161 College Ave. in Factoryville, from 10 a.m. to noon. • Tuesday, March 14, at the Hunlock Township Building, located at 33 Village Drive, Hunlock Creek, from 10 a.m. to noon. • Wednesday, March 15, at the Falls Senior Center, located at 2813 Sullivan’s Trail in Falls, from 11:30 a.m. to 1:30 p.m.
• Tuesday, March 21, at the Benton Township Community Center, located at 16043 Route 407 in Fleetville, from 10 a.m. to noon. • Tuesday, March 28, at the Laceyville Borough Building, located at 342 Church St., Laceyville, from 3-5 p.m.
On Wednesday, March 1, the American Legion will hold office hours at the Tunkhannock district office, located at 133 West Tioga St., Suite 4, in Tunkhannock from 10 a.m. to noon. The Mobile Vet Center will be in the Ace Hardware-Brady and Cavany Store parking lot in Eaton Township on Monday, March 6, from 10 a.m. to 2 p.m. Some of the services available for veterans and their dependents include individual, group, family and bereavement counseling; medical referrals; assistance in applying for Veterans Affairs benefits; employment counseling; guidance and referrals; and alcohol and drug assessments. A caseworker for U.S. Congressman Lou Barletta (R-Hazleton) will be at the Tunkhannock district office on Monday, March 20, from 10 a.m. to noon. Assistance will be available for constituents who are having problems with federal agencies and programs, and constituents are encouraged to bring documents they have received from federal agencies related to their issues. Veterans outreach hours will be offered on Tuesday, March 21, at the Dallas district office from 10 a.m. to 2 p.m. A claims consultant from the Wilkes-Barre Veterans of Foreign Wars (VFW) will be on hand to address questions and concerns of local veterans and their families. A representative from the Center for Independent Living is available for appointments at the Tunkhannock district office on Tuesday, March 21. Please call the Tunkhannock office at 570- 836-4777 to make an appointment. A representative from the University of Scranton Small Business Development Center will be at the Tunkhannock district office on Tuesday, March 28, from 10 a.m. to noon. The University of Scranton Small Business Development Center provides educational programs and no-cost, confidential consulting services to entrepreneurs looking to start or grow a small business.